Speculation that Roy Keane will take over from Neil Lennon as Celtic manager intensified after the Republic of Ireland No2 dodged a scheduled press conference appearance ahead of their friendly against Italy at Craven Cottage. The Manchester United legend, who ended his illustrious playing career with a one-season swansong at Celtic is now the overwhelming 1/6 favourite to take up the Parkhead post. Ireland manager Martin O’Neill confirmed suspicions that his assistant had left the Ireland camp to take up talks with the Scottish champions. 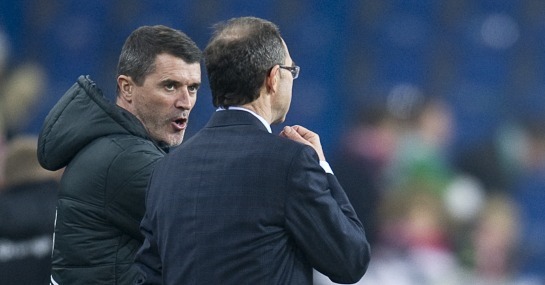 O’Neill said: “I had a call from Dermot Desmond wanting to speak to Roy and I mentioned it to Roy. I am sure he was wanting to have a chat anyway because a club like Celtic might not come around very often. job, which include Scotsmen Owen Coyle (7/2), Malky Mackay (7/1) and David Moyes at 12/1. All three had lost jobs at their respective clubs during the season and had been widely fancied before Keane emerged as the leading candidate. Should Keane get the nod It would represent a quick turnaround for the ITV pundit, who was only appointed to his role with Ireland back in November 2013. Keane previously got Sunderland promoted to the Premier League, before a 20-month spell as Ipswich manager ended in the boot with the club languishing in 19th place in the Championship.